Newts are vertebrates, like us they have backbones. However, unlike us they are cold blooded, which means they cannot keep themselves warm and their body temperature goes up and down, as the air or water temperature around them changes. They are amphibians like frogs and toads. They have to lay their eggs in water and young newts have gills like fish. As they grow they lose their gills and grow lungs. The adults can live out of water but need to stay damp or they dry out too much, so they do not bask in the sunshine like reptiles. They hide away during the day and come out during the evening to hunt for food. Biddenham village pond supports both the great crested newt and the common (or smooth) newt. 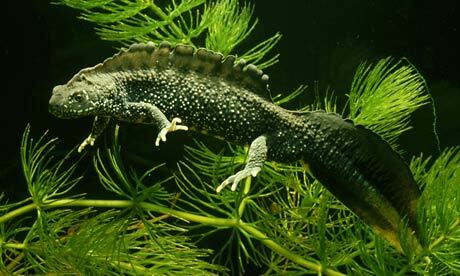 The great crested newt is the biggest and the rarest of the newts found in the UK. It can grow up to 17 cm and live for up to 15 years. Another name for it is the warty newt because its skin has tiny white spots and warty bumps. Males and females have a bright orange belly with black spots and the male grows jagged crests along its body and tail in the spring. The great crested newt is a rare animal and it is important that we look after them here in Biddenham. The ponds they need to breed in are being lost, through pollution, destruction and lack of management (ponds will tend to grow over with plants unless they are looked after). Ponds with fish are also bad news for great crested newts because fish eat the baby newts. We don’t have fish in our pond anymore. Adult great crested newts taste horrible because their warty skin contains poisons (a Victorian scientist discovered this when her cat became ill after biting a newt – the cat did recover). This puts off mammal predators but herons and jackdaws still eat them. The baby newts have no warts to protect them and may be gobbled up by fish, though not in our pond. Female great crested newts lay around 200 eggs in a season, about 2 or 3 a day, and carefully wrap each egg in a folded over leaf to protect it from predators. When the baby newt hatches it looks like a tiny adult but also has gills and a fin on its tail. Adult newts leave the pond and shelter under logs and stones during the day so they don’t dry out. They hibernate in the winter in crevices deep under the soil or under stone walls where they will not be frozen. Adults usually remain within 500 m of their breeding site, and most return to breed to the pond where they were born. Adult newts are carnivorous and eat little creatures found in the soil and water, such as small worms and insects. Baby newts eat small pond creatures such as water fleas – or each other! As great crested newts are so rare, they are protected under UK and European law. It is against the law to kill or injure them or pollute or damage the ponds they live in. Their scientific name is Triturus cristatus. 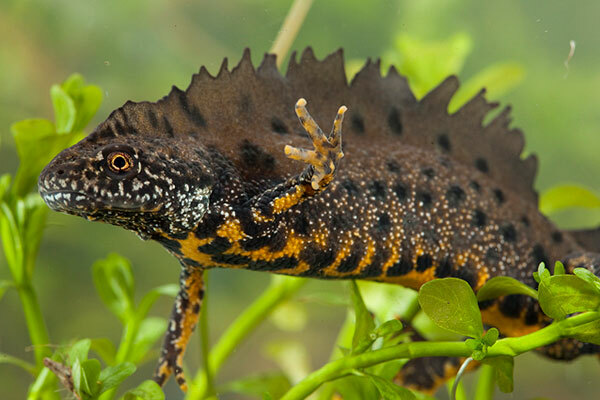 If you would like to, you can read more about the great crested newt.